The NMX-NVR-N6123 is a network video recorder (NVR) designed to record hours of high-resolution, HD content over an Ethernet LAN. 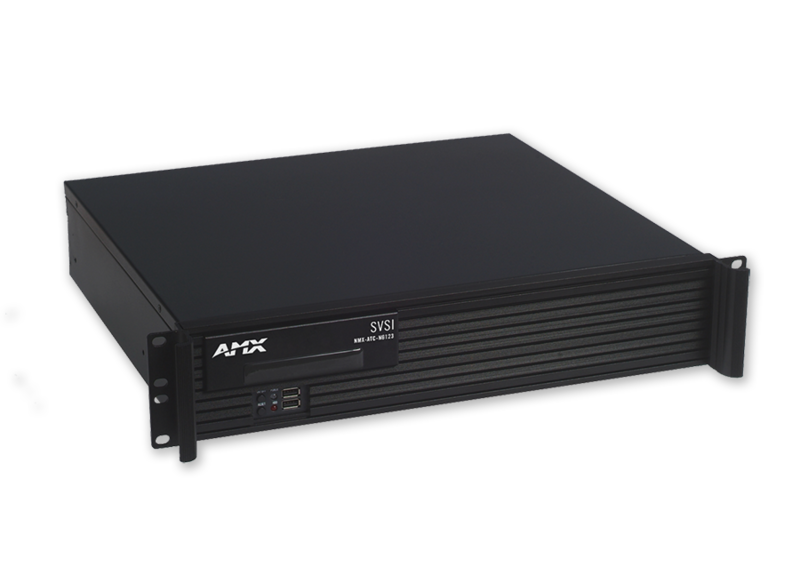 This rack-mount NVR is compatible with all SVSI video-over-IP products and attaches to the video network at any point. The NMX-NVR-N6123 can record from any SVSI encoder (N2000, N3000, or V-Series) and uses any SVSI decoder in the same series for playback. Each video stream is recorded and played back at its original resolution. 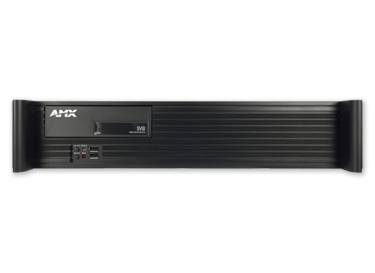 The NMX-NVR-N6123's 2RU form-factor is stackable for a high density of recorded video streams in a small footprint. SVSI's N-Command is used to control all of the product's features (including Time-Shift, Dual-Sync, and H.264 Conversions). Time-Shift mode allows a recording to be delayed from several seconds to several hours to coordinate between different venues. Recordings can be initiated at one location and playback started at a separate location.This feature is supported by the N2000 and N3000 Series only. During a presentation, the NVR records one video stream from a camera (videoing the presenter) while the second video stream records the content that the presenter is displaying on-screen. During a lecture or worship service, the NVR records two camera feeds (focused on the same event, but from different angles) and the cameras' common audio track. 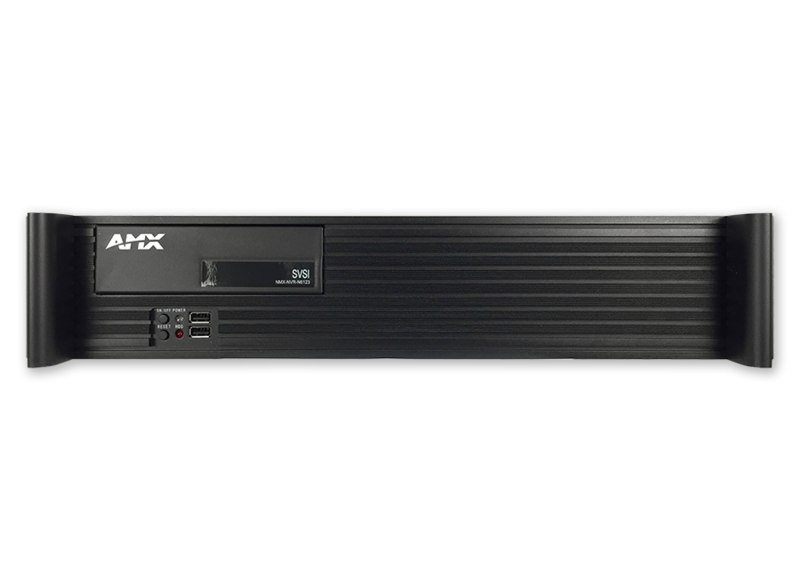 The NMX-NVR-N6123 is ideal for educational institutions, houses of worship, or corporate campuses that want to simultaneously distribute live video through a facility and record it for future network transmission or other delivery methods. Dual-Sync and Time-Shift – Features standard. Recording and Playback Streams N2000, No. Channels: 1, Recording 2 (dual), Playback Streams: 2 (dual)*; N3000, No. Channels: 10, Recording 10, Playback Streams: 10. See Data Sheet for details. Estimated Recording Time: 1080p sources at high quality N2000, 43 hours 27 minutes; N3000, 434 hours 39 minutes. See Data Sheet for details. Estimated Recording Time: Convert 1 hour of 720p video to MP4 N2000, 43 hours 27 minutes; N3000, 434 hours 39 minutes. See Data Sheet for details.